Ken Paxton is the first Texas attorney general to be indicted while in office in more than 30 years. When former Governor Rick Perry was indicted last year on charges that he had overstepped his authority in vetoing funding for the Public Integrity Unit, he pushed back… hard. In a piece of peerless political theater, dozens of supporters appeared at the Travis County Courthouse while he took his booking photo. Proud and resolute, he took to a podium to slam the charges against him, as the crowd cheered and waved signs. Prominent Texas Democrats came too, to bathe in schadenfreude, but they saw a man unbowed. Then he went to get ice cream. That day set the tone for all that followed, and helped make it possible for Perry to run a credible campaign for president while facing jail time. Compare that to developments in the ongoing travails of Attorney General Ken Paxton, who was indicted on three counts of securities fraud last Tuesday and got booked on Monday at the Collin County Courthouse. He missed a chance to set the tone for his defense, on home turf. He attempted a Tom DeLay-style smile in his mugshot, but it came off as a smirk. As the press waited in the front of the courthouse for a statement, Paxton slipped out the back, carried to safety in a black SUV. If Texas politicians are refining the art of how to get indicted, Paxton showed us what not to do. He communicated Monday that he was on the defensive. He should be. Paxton’s case is fundamentally different than Perry’s, which seems to revolve around fairly arcane questions of the proper role of the governor in state government. The case against Paxton is startlingly simple. Where Perry has successfully sold a narrative that he is being prosecuted over a matter of principle, Paxton is being prosecuted for graft. While he was a state representative, he took commissions for putting his legal clients in the hands of a shady investor, and he failed to tell them or the state he was doing so. In other cases, this is where we’d put the word “allegedly,” but of course Paxton has already admitted to violating securities law. He admitted to it before he was elected. 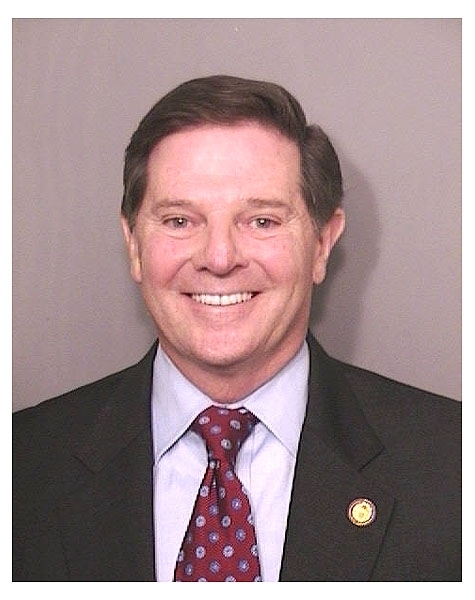 Former Republican House Majority Leader Tom DeLay wore a suit, tie and congressional lapel pin to the Harris County Sheriff’s Office where his mugshot was taken in 2005. But the special prosecutors in the Paxton case have deepened his troubles considerably, by expanding the charges against him to matters concerning Servergy, Inc, based in McKinney. Servergy was, in essence, a fake tech company. The company promised a miraculous product and didn’t deliver. Executives with Servergy faked paperwork, according to the SEC, that showed pre-orders from companies like Amazon, and on the basis of their alleged fraud the company sold some $26 million in stock. The founder of the company, Bill Mapp, appeared at the courthouse on the day Paxton was indicted. Paxton, the prosecutors charge, earned commissions from helping to sell some of that stock, without telling the investors he lured or the state he was taking a cut. He even sold stock to state Representative Byron Cook, R-Corsicana, according to the charges. For that, he faces two first-degree felony counts. What next? Paxton’s plan, as seen in the public statements of his Parselmouthed spokesman Anthony Holm, is to convince his supporters these charges are part of a witch hunt, just like what happened to Perry. Some of his most fervent supporters will continue to believe this: Michael Quinn Sullivan’s propaganda network is in full swing, and some tea party leaders in the Metroplex have adopted Sullivan’s line of “thought.” But North Texas Tea Party leader Michael Openshaw, a prominent figure in these circles, has urged Paxton to “step aside” from his day-to-day duties as attorney general. As more conservatives realize that Paxton could be Hindenburg-ing in the coming weeks and months, there might be some more that step away. And Paxton will need the support of his fellow statewide elected officials to survive this. So far they’ve been surprisingly quiet. There’s reason to believe that Governor Greg Abbott’s office has no great special love for Paxton. But even normally verbose Lieutenant Governor Dan Patrick, who’s happy to pound his fist on the table about just about anything and should be one of Paxton’s best allies in state government, has been quiet. On Sunday, a spokesman told one NBC affiliate he was “unavailable for comment,” which might be a first. Finally Monday, he issued a two-sentence statement after Paxton was booked, complementing a one-sentence statement from Abbott. Both urged respect for the legal process. There’s a reason why Texans have warily observed this news. Some of the outrageous events surrounding this sloppy process certainly do not typify the level of quality that Texans expect from our judicial system. This is, in the immortal words of California Governor Jerry Brown, barely a fart, though it’s understandable that Paxton’s supporters are raising process concerns rather than substantive concerns. Ken Paxton, like all Americans, deserves to have his say in a court of law, rather than be judged in a court of public opinion that is presided over by liberal interest groups. When Perry was indicted, party chair Steve Munisteri personally showed up outside the courthouse to yell at reporters that Perry would beat his dumb charges and be a strong contender for the presidency. Overnight, the GOP made Perry a hero, a modern-day Joan of Arc, who libs wanted to burn at the stake for his healthy head of hair and strong leadership skills. The assertion that Paxton deserves his day in court is not exactly the rousing call to arms that he might have hoped for. Good luck, Ken!